FirstEnergy utility personnel are prepared to respond to any outages caused by severe winter weather forecast across most of its utilities’ service territories later today and into Wednesday. The storm is expected to produce a wintry mix of ice and heavy snow, with current forecasts projecting the most severe conditions in central Pennsylvania and western Maryland. 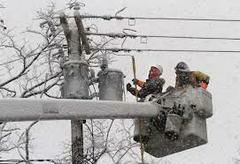 All of FirstEnergy’s 10 electric utilities have activated storm response plans, including staffing additional dispatchers and analysts at regional dispatch offices, and making arrangements to bring in additional line, substation and forestry personnel, as required, based on the severity of the weather. In addition, FirstEnergy is bringing in contractors to assist with its storm restoration efforts. Customers who are without power are encouraged to call 1-888-LIGHTSS (1-888-544-4877) to report their outage or click the “Report Outage” link on www.firstenergycorp.com. In the event of severe weather, customers should immediately report downed wires to their utility or their local police or fire department. Customers should never go near a downed power line, even if they think it is no longer carrying electricity. FirstEnergy customers also can utilize a new free smartphone app to report outages and access important information and services related to their electric accounts. The app is available for Apple® iPhone® and Android™ smartphones. Customers can use the keyword "FirstEnergy" to locate the apps in the online store. • Keep a flashlight and extra batteries handy. Use care when burning candles; open flames are a fire hazard. • Keep a battery-powered radio with extra batteries on hand. Tune to a local station for current storm information. • Have a hard-wired telephone or a charged cell phone handy in the event you need to report your electricity is out. Mobile phones can be charged in your vehicle using a car charger when the power is out. If you have a smart phone, this will ensure you have access to online information sources.